These 50 North American container ports are leading the way in TEUs and making way for anticipated growth in the future. The two largest ports by TEU are both located in the Golden State of California. For each dollar invested, the Port of Georgia expects a profit of $7.3 dollars to the U.S. economy. As global trade continues to grow (albeit at a slower pace than the World Trade Organization initially projected for 2018), there are some ports that are already processing an impressive number of twenty-foot-equivalent units (TEUs). A TEU is a unit of measurement given to cargo capacity, based upon the volume of a 20-foot-long container. Height does not factor in when determining TEUs, though most containers range between four feet, three inches and 9 feet, six inches. When a port processes a TEU, one container counts as one TEU. When a port processes 9.3 million TEUs in a year like the Port of Los Angeles, that earns them the No. 1 spot on Global Trade’s Top 50 North American Container Ports. But while some ports are already doing big business, a greater push for more efficient container ports is being applied across the continent. While many larger ports are already equipped to handle large vessels, many simply cannot accommodate the newer, larger Panamax-sized ships which are becoming increasingly more common thanks to new larger size limits allowed by the Panama Canal expansion. Super Panamax, Post Panamax and Neo Panamax vessels got their name from the Panama Canal Authority (ACP) in 1914, but newer requirements were enacted on June 26, 2016, when the Panama Canal opened its most recent set of locks. Whether a vessel is Panamax, Neo Panamax, Super Panamax or Post Panamax is based upon the Panama Canal’s initial lock chamber dimensions of 1,050 feet long by 110 feet wide by 41.2 feet deep. These guidelines allow the ACP to determine whether a ship can pass through the canal, by factoring in the width and depth of the water in the available locks, as well as by the height of the Bridge of the Americas, which these ships must pass under on their way through the canal. But Super, Post and Neo Panamax ships aren’t just larger, they’re more efficient, too, thanks to their ability to carry more cargo per trip. Unfortunately, all that efficiency is for naught if a port can’t accommodate that size vessel. The good news is that an increasing number of ports are expanding to accommodate these ships, investing millions of dollars to dredge deeper waterways and wider locks, expanding docks, adding cranes, extending existing rail and much more. Among those ports, many of the top 50 have gone above and beyond to expand and improve, earning them spots among the top 50 container ports by TEU in North America. The two largest ports by TEU are both located in the Golden State of California. With more than 9.3 million TEUs in 2017 alone, the Port of Los Angeles is the No. 1 port by volume in North America, with the Port of Long Beach not far behind with 7.5 million TEUs the same year. So, what’s bringing so much cargo to the Left Coast? In addition to its capacity for larger Panamax ships and high volume shipments, the Port of LA’s proximity to Asian markets such as China, Japan, Hong Kong, South Korea, Vietnam and Taiwan that make it so popular. In fact, the 7,500-acre Port of LA alone processes 20 percent of the foreign cargo entering the United States. Just nine miles south of the Port of LA, No. 2 ranked Port of Long Beach prides itself on being a popular cruise ship port as well as one of the “greenest” ports in the world. With its Green Port Policy initiative and more than 20 years of environmental protection programs, the Port of Long Beach strives to reduce its environmental footprint, encourage sustainability and protect the greater community from environmental impacts the port may make. As such, the port has invested $4 billion dollars toward efforts to become a zero-emissions port in the coming years. One way North American ports are accommodating the new Super and Neo Panamax ships is by changing infrastructure and expanding ports to allow larger vessels to maneuver through locks with ease. The Port of Miami (No. 18) recently invested $1 billion into a major port overhaul and expansion, complete with channel widening (from 50 to 52 feet), $50 million dollars in rail improvements, and several super Panamax-capable cranes with 22-container outreach that are the biggest in the entire Southeast United States. A $350 million-dollar expansion at the Port of Virginia (No. 7) is slated to be completed in 2019 and will include a brand new, 26-lane motor carrier gate, rail mounted gantry cranes (RMGs) to allow for higher container stacks, and various rail improvements. Not far up the coast, the Port of Baltimore is investing in several port-related projects around the city, including replacing the dilapidated Colgate Creek Bridge, which will expand access from the port to Interstate 95 for larger logistics trucks. A recent purchase of 70 acres of land will enable the port to store and process the increased amount of cargo coming off Super Panamax vessels. The expansion is expected to generate 1,650 new jobs for the city. This past September, the Port of Georgia (No. 4) announced it would be investing $2.5 billion over the next 10 years to jump from its current capacity of 5.5 million, 20-foot TEUs to an impressive 8 million. It’s part of a whopping $14.1 billion in investments over the next five decades. For each dollar invested, the Port of Georgia expects a profit of $7.3 dollars to the U.S. economy. Not too far north, the South Carolina Port Authority has committed $2.4 billion to deepen the Port of Charleston (No. 11) to 52 feet, making it the deepest port on the East Coast by the year 2021, and capable of an 8 million TEU capacity by 2028. Furthermore, the port plans to double its rail capacity by the year 2020. With a planned 180,000 additional feet of rail, the project is part of a strategy to cut 24 hours off transit time to the Midwest. The Port of Philadelphia (No. 24), now known as PhilaPort, doesn’t just carry cargo but a rich history dating back to 1701 and the days of William Penn. But the 300+-year-old PhilaPort is anything but dated. Today, the port is undergoing improvements as part of a $300-million expansion authorized in 2016. 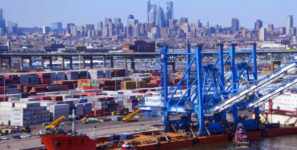 The funds will be used to double PhilaPort’s container capacity, improve their PAMT terminal and increase the terminal’s capacity from 485,000 to 900,000. Philaport is also undergoing a channel expansion which will bring the main channel from its current 40 feet to 45 feet to accommodate larger Super and Neo Panamax ships. The Port Authority of New York and New Jersey (No. 3) is in the midst of a $4-billion expansion and improvement project that will make room for Super Panamax vessels, as well as their increased cargo load. The U.S. is not the only country with ports making big changes—and doing big business—in North America. Canada is also home to two notable ports. The Port of Vancouver (No. 6), which is the largest port in Canada and the sixth-largest in North America, boasts a decidedly global hub, while the Port of Montreal (No. 12) does much of its business with Europe. The Port of Vancouver processes about 2.9 million TEUs each year. Located on Canada’s west coast in picturesque Vancouver, British Columbia, the Port of Vancouver contributes $24.2 billion CDN to Canada’s economy each year, supplying about 92,600 jobs in British Columbia and an additional 115,300 jobs across Canada. On Canada’s east coast, the Port of Montreal processes more than 1.5 million TEUs annually and has recently entered a partnership with the Centre for Technological Entrepreneurship (CENTECH) and École de technologie supérieure (ÉTS) to create a “port logistics innovation unit.” The aim is to help address modern issues facing the port such as cybersecurity, supply-chain visibility and decarbonization and process improvement. The innovative program will be the first of its kind in North America. The Port of Montreal also happens to be the closest port to Europe, and as such offers the shortest direct route of any North American port from Europe and the Mediterranean. South of the U.S. border in the State of Colima, Mexico, is the Port of Manzanillo (No. 8), which processes more than 2.8 million TEUs per year. The largest port in Mexico, the Port of Manzanillo is the only container port from the country in the top ten. The port generates most of its business from iron ore, pectin, pickles (yes, pickles), cement and seafood products such as giant squid, swordfish, tuna and even shark. Much like the No. 3 ranked Port of New York and New Jersey, the Ports of Seattle and Tacoma have merged to create the Northwest Seaport Alliance, which has rounded out the top of the list at No. 5. In 2017, the Northwest Seaport Alliance processed more than 3.6 million TEUs, with a 15.6 percent increase in September 2018 over the prior year—the biggest increase in September volume since 2005. The port hopes to increase its annual TEUs from its current rate of 3.6 million annually to 6 million by the year 2025, generating 14,600 new jobs in the process. In addition to being a major gateway for cargo from Asia and a major distribution point for cargo from Asia heading to the Eastern United States, the Northwest Seaport Alliance is also home to the Puget Sound, which has the strategic position of being an important gateway to Alaska. In fact, according to the Northwest Seaport Alliance, more than 80 percent of total trade volume between Alaska and the rest of the U.S. passes through the alliance’s North and South harbors. This past September, the Port of Wilmington (No. 27) in Wilmington, Delaware, was sold to Gulftainer, a United Arab Emirates-based port operator on a 50-year concession. Gulftainer plans to invest $600 million into the improvement of the port. No stranger to North American ports, Gulftainer also currently operates Florida’s Port of Canaveral. Of Gulftainer’s planned $600-million investment, $400 million would go toward a new, 1.2 million TEU container facility. Currently, the Port of Wilmington can process 600,000 TEUs. A new cargo terminal and training facility are also slated for development with the new concession. The State of Texas is home to several major ports, including the Port Houston (No. 9) and Port Freeport (No. 39), both of which are undergoing expansions of their own. Port Freeport is planning a major expansion which will deepen the port from its current 45 feet to 55 feet. It also will be lengthened to 2,200 linear feet to accommodate larger Post Panamax vessels. There are also plans at Port Freeport to expand operations from 125,000 TEUs to 800,000 TEUs each year with the addition of 90 acres of land that will be developed for container operations in the coming years. Another current Port Freeport development is the Velasco Container Terminal, which upon completion will include another 130 acres of land where 1.5 million to 2 million TEUs will be processed annually. The Velasco Container Terminal will eventually house five Post-Panamax gantry cranes. North of Port Freeport is inland Port Houston, which is undergoing some big changes of its own. Thanks to a $314 million budget approved in 2016 by the Port Commission, Port Houston is slated to undergo numerous repairs on existing properties. Current projects include rehabilitating Wharf Three to accommodate 100-gauge, ship-to-shore cranes, construction of 6,500 feet of railroad track and the demolition of several buildings and Lash Dock. In addition to these improvements, Container Yard 7, which will span 50 acres of land, is being constructed at Port Houston. According to the facility’s website, the yard will boast reinforced and roller-compacted concrete pavement and will be fully equipped with water and sewer, stormwater collection, communication conduit and high-mast lighting. Future plans for Port Houston include adding five security cameras, installing numerous drainage systems and conducting general repairs around the port. These 50 North American container ports are leading the way in TEUs and making way for anticipated growth in the future. From updating security systems to survive in an increasingly “cyber” world, to fixing irrigation issues and repairing dilapidated structures, more and more ports are turning their focus to customer service, making their facilities more modern, efficient and comfortable. Additionally, many ports are dredging deeper and wider channels to make room for larger Post Panamax, Super Panamax and Neo Panamax ships that are quickly becoming the norm. These ships don’t just enable shippers to ship more product at once, they also create a major savings in time and money for both the shipper and the ship. Plus, with fewer ships in the water, this larger class of Panama ships allows for a greener footprint, reducing emissions. Larger ships also mean more work unloading, and thus have the potential to generate more jobs, boosting local economies—and isn’t that what trade is all about?